An isolated population of quail on Tiritiri Matangi Island , could prove to be New Zealand quail – a bird considered to be extinct since about 1875. While many of New Zealand’s endangered birds have made headlines in the world famous conservation success story surrounding the Hauraki Gulf island, no one has paid much attention to the long established quail population. Now the birds are the subject of a genetic and ecological study by a Massey doctoral student who says it’s possible they may be the New Zealand quail, coturnix novaezelandiae. Once abundant throughout the country and on Great Barrier Island, these quail were thought to have been wiped out through habitat destruction and predation soon after European settlement. Mark Seabrook-Davison is part of the University’s Auckland-based Ecology and Conservation Group. With his co-researchers he has a close connection with projects on Tiritiri Matangi and says that although the quail are known to have been on the island for at least 100 years, there are no records relating to them. Genetic testing will be carried out at the Allan Wilson Centre laboratory at Albany. The samples will be compared with genetic samples from other locations and from the populations of introduced Australian quail. 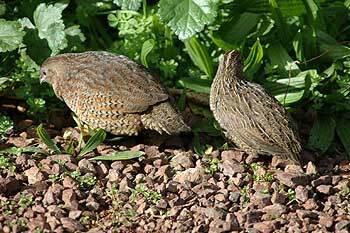 “At this stage the notion that these quail may be a surviving group of New Zealand quail is quite speculative. It’s also been suggested that they may be a hybrid,” says Mr Seabrook-Davison. He says that the ecological study he is carrying out in conjunction with the genetic testing will also have important implications for future conservation projects in the Hauraki Gulf Islands. Both the Australian quail and the more widespread Californian quail, were released into New Zealand as game birds.